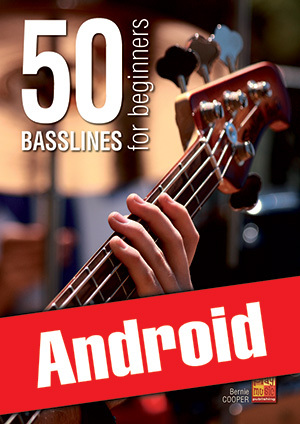 50 Basslines for Beginners (Android) (BASS GUITAR, Courses for Android, Bernie Cooper). You are beginning to play the bass and would like to make progress while having fun and without delay? Then you are holding the right method in your hands! On the menu, no less than 50 simple bass lines accessible to beginners and inspired by the greatest artists, past and present: The Beatles, AC/DC, Bob Marley, Deep Purple, Eric Clapton, Elvis Presley, Police, ZZ Top, James Brown, Jimi Hendrix, Otis Redding, U2, Led Zeppelin, The Rolling Stones... In order to help you, each bass line is preceded by an explanatory text detailing its technical, rhythmical and theoretical aspects. Difficulty increases progressively throughout the pages. The Video DVD allows you to hear and moreover to watch these 50 bass lines as they should be played, giving you the opportunity to see the correct moves, to pick the right fingers and to be rhythmically accurate! The mp3 CD contains as many tracks as bass lines, that is 50 play-along tracks featuring two different tempos: the objective tempo (normal) and the practice tempo (slow). On the normal tempo track, the bass plays over the first cycle and is mute hereafter to let you take the place! Lastly, these tracks have a deliberately long duration (3 to 4 minutes each, more than 7 hours of music then!) to give you time to practise in the best possible conditions.